Cutler Hammer (CH) originally manufactured the F-2100 Series, F10 Unitrol Series, 9800 Series and Freedom Series Motor Control Center (MCC) Buckets over the past three decades. Although Cutler Hammer still supports the F-2100, F10 Unitrol, 9800 and Freedom Series MCCs, Rebuilt MCC.com can supply completely remanufactured Cutler Hammer Motor Control Buckets and related parts. Why do our customers continue to chose our completely rebuilt buckets? 1.) New Components: Although the CH F-2100 Series, CH F10 Unitrol Series, CH 9800 Series, and the CH Freedom Series MCCs were built decades ago, our rebuilt models are retrofitted with NEW components bringing your Motor Control Centers up to the latest technology without replacing the entire MCC. 2.) Cost: When a MCC Bucket fails, there are two options; the first: Go Rebuilt, the second: Go New. Going new is a headache as the failed bucket is not all that needs to be replaced. 3.) Green: In these times of environmental turmoil, opting for rebuilt MCC buckets directly supports intense recycling efforts. Our buckets are completely remanufactured, which eliminates the requirement for new steel and other recyclable metals. So start associating going rebuilt with going green! 4.) Warranty: Cutler Hammer originally gave a full one year warranty with the F-2100 Series, F10 Unitrol Series, 9800 Series and the Freedom Series buckets, so why shouldn’t we? We’re so confident in the overall quality of our work that we include a FULL one-year warranty with all of our reconditioned MCC buckets. 5.) Quality: Our staff of highly qualified, safety conscious, graduate engineers take the primary role in the remanufacturing process of Cutler Hammer Motor Control Buckets. Our 80 year old company’s experience is strongly reflected in the overall quality of our rebuilt buckets. 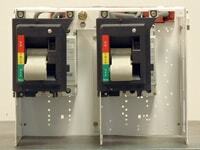 Most components for motor controls can be identified and quoted right over the phone. Call us for an instant quotation.